Washington, George (1732-1799) Autograph Survey Signed, Augusta County, Virginia, 16 April 1751. 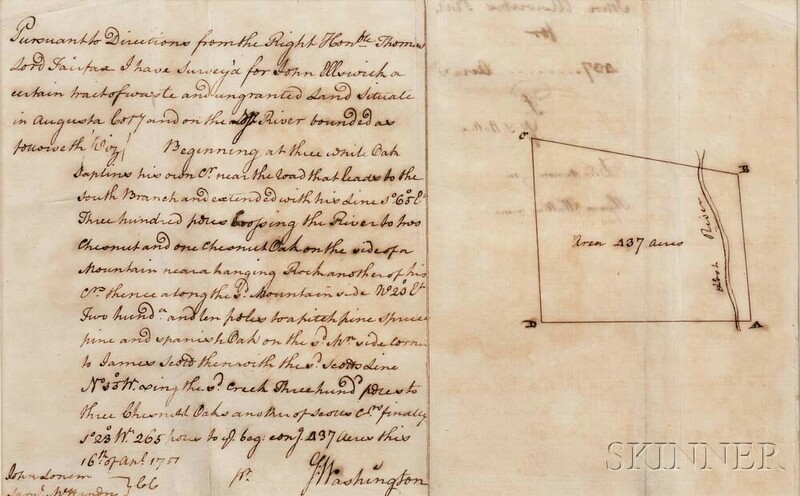 Single leaf of laid paper bisected vertically with a double line; text on the left portion describing the surveyed property in Washington's hand, signed at the foot; the plat drawn on the right portion, docketed on verso. The survey was prepared for John Elswick, in Augusta County, Virginia, regarding 437 acres of "waste and ungranted land" along the Lost River, this land was subsequently granted to Thomas Walter on 18 March 1755; signed by Washington in the lower right corner of the survey portion of the sheet; in the bottom left corner, Washington identifies his chain carriers: John Lonem and Samuel McHandry [aka Samuel McHenry]; this survey formerly the property of actor Barry Bostwick, very good, with some old folds only, matted and framed, 11 1/2 x 7 in. (sight). "Between the ages of 17 and 20 GW was a practicing professional land surveyor. During that time he made more than 190 surveys, nearly all of them for grants of new lands on the frontiers of Lord Fairfax's Northern Neck Proprietary. Frontier surveying was a lucrative business in Virginia at the middle of the eighteenth century, as swarms of settlers and speculators laid claim to the colony's western lands, both inside and outside the Northern Neck. A diligent frontier surveyor working only a few months out of the year could clear annually £100 or more in Virginia current money, a cash income greater than that of most planters and tradesmen in the colony. Frontier surveyors, in addition, had ample opportunities to patent choice tracts of land in their own names, and many acquired holdings of several thousand acres. Surveying was a respectable occupation for a young Virginian in 1749, roughly on a par with law, medicine, the church, or military service, and most of the surveyors were drawn from the Virginia gentry." (Founders Online, UVA, http://founders.archives.gov/documents/Washington/02-01-02-0004). It is unclear for which John Elswick this survey was performed. Elswick I (1690-1759) seems the likeliest candidate, although most records place him in West Virginia. His son John Elswick II (1720-1749) passed away before the survey was done, although he was a resident of Augusta County, Virginia, and his son, Elswick III (1745-1837), known as "War John" was only six years old at the time of the survey. Washington also performed a survey for one of the Johns Elswick on 5 November 1749, regarding 406 acres on the Lost River. This land was subsequently granted to a different man of the same name on 3 June 1751.